1. Introduction. Assynt boasts some 680 lochs and lochans (as shown on the 1:50,000 O.S. map), and many more smaller bodies of water. There is therefore no lack of suitable breeding habitat for amphibians. Three species are known to occur, and there are intriguing, if ancient, reports of a fourth. 2. 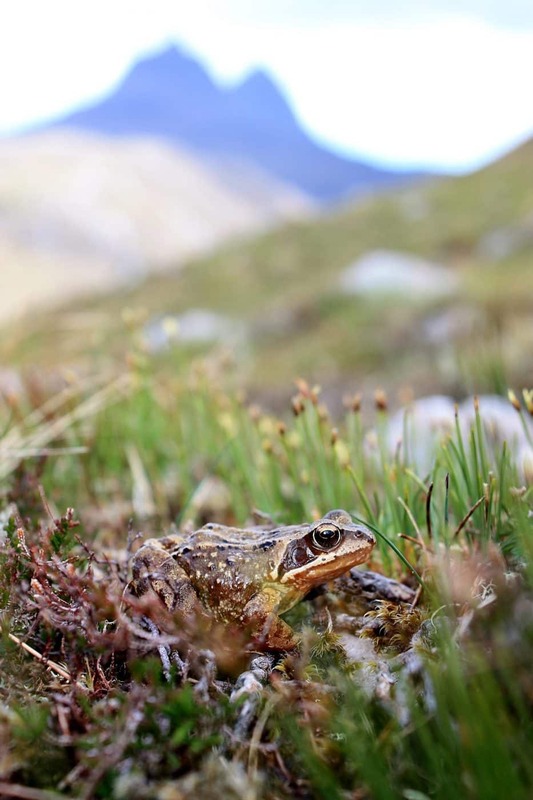 The Common Frog, Rana temporaria, is the commonest amphibian in Assynt, occurring in a wide variety of habitats from the coast to high in the hills. The total population of adults is probably in excess of 100,000. Adults vary in colour through shades of olive green, yellow, brown and red, often well-marked with black. Spawning takes place from early March, the earliest often about 6th, in water bodies varying in size from temporary pools on tracksides and in peat cuttings, artificial tanks, to the shallows and backwaters of burns and lochans. The spawning sites range in altitude from just above sea level at Clachtoll to some 335m (1100ft) east of Lyne, although adults have been seen much higher. Spawning is appreciably later up in the hills. Early spawn in exposed sites is sometimes frosted and killed. Tadpoles have been seen from the end of March and newly metamorphosed froglets start leaving the spawning sites in mid-July. However, large tadpoles have been seen in high locations late in the year, and it is thought that they may take two years to complete their development. There is a movement of adults on warm, wet nights in mid-October, presumably to hibernation quarters, which are usually under water in this species. Prolonged cold weather may cause numbers of frogs to die in shallow bodies of water, which become anoxic under the ice. Common frogs are heavily predated on their way to and from spawning sites, by otters and other carnivorous mammals, by herons, tawny owls, buzzards and probably other birds of prey, and large numbers are also killed on the roads. One product of such predation is the so-called ‘star-slime’ the jelly-containing remains of the oviducts of females, deposited on the ground or on the tops of walls. Apparently, all other parts of the frog are eaten. Tadpoles also make a ready snack for aquatic predators such as dragonfly nymphs, water beetle larvae, leeches and, no doubt, brown trout. Frog tadpoles can be a little difficult to distinguish from those of toads, but the pattern of the teeth surrounding the mouth is diagnostic (3 rows above and 4 below in frogs, 2 and 3 in toads). 3. The Common Toad, Bufo bufo, is probably the next most frequent amphibian in Assynt, easily recognized by its warty skin. 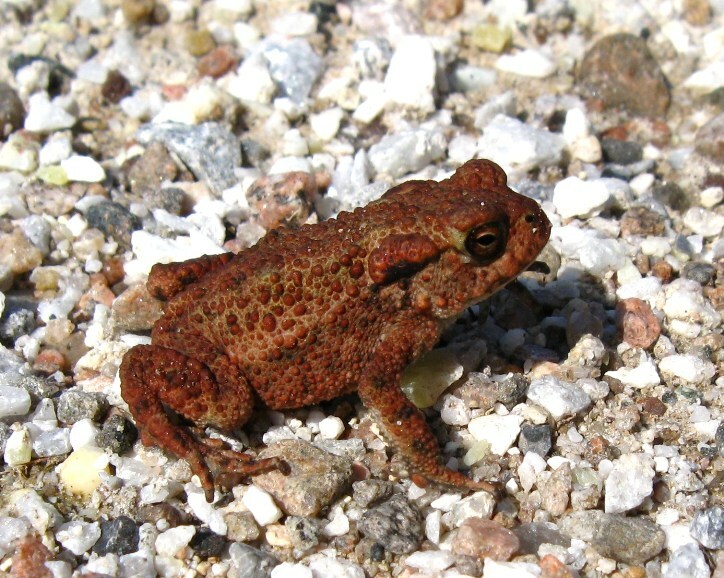 Adults have been seen from just above sea level to quite high in the hills, but toads may be commoner in the fertile coastal fringes of the parish. They spawn in considerable numbers in particular lochans, an example being Loch an Ordain, just north of Lochinver, where over a thousand adults have been counted crossing the road by Erica and John Gorman in past springs. Toad spawn is not so easy to find as that of frogs, since the ropes of eggs are looped around aquatic plants, often in deeper water. 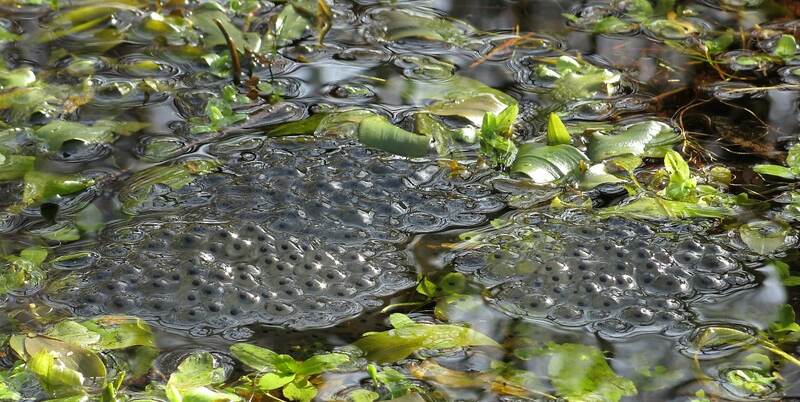 Although the adults are about in March, spawning may be somewhat later than frogs, from early April. Given that many other lochs are known to be spawning sites, the total population of adult toads in Assynt is probably well in excess of 10,000. Toads are known to be predated by otters, badgers and probably foxes, which turn their skins inside out, and they are also killed in numbers on the roads during their migrations to spawning sites in the spring and again about October, when they are moving back to hibernation sites on land. 4. The third local amphibian is the Palmate Newt, Lissotriton helveticus, which is not seen as often as the other two. Males are most easily recognised in the breeding season, when they sport black webs to their hind feet and a filament extending from the cut-off ends of their tails. Their bellies are pale and almost spotless, as are those of the females. 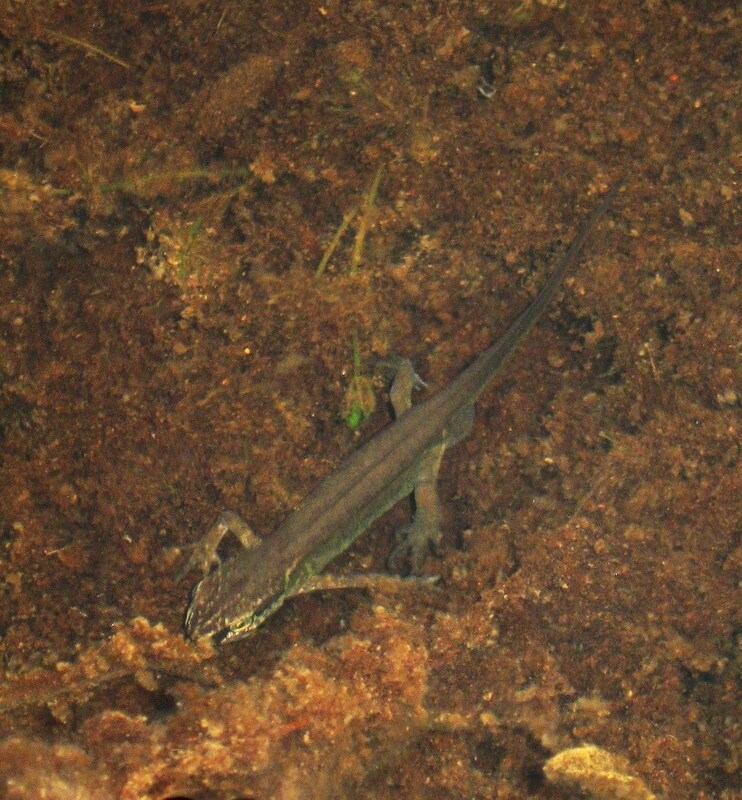 Palmate newts spawn in shallow lochans and pools, particularly those lacking fish, which predate them. They move to the spawning sites in early March and the fertilised eggs are wrapped singly in the leaves of water plants. Egg-laying is said to extend through to June, and tadpoles and adults are often present together. After leaving the water later in the summer, palmate newts remain on land until they mature, which may take several years, and it is in this land phase that they are most frequently encountered, for example in gardens. Their known distribution in Assynt is patchy away from the inhabited parts, especially around the coast, but this may be ‘observer-bias’. Given the considerable numbers that have been seen in favoured spawning sites, their total population may well be in excess of 10,000. Palmate newts are almost certainly predated by a wide range of larger organisms from the egg-stage onwards. The remains of several were found, for example, in the stomach of a trout caught in Loch Leathad an Lochain, near Inverkirkaig. 5. There is one historic record of the Great Crested Newt, Triturus cristatus, in Assynt, mentioned in A Fauna of Sutherland, Caithness and West Cromarty by J.A. Harvie-Brown and T.E. Buckley (1887), p.250, where it states, ‘Messrs. Alston and Harvie-Brown have met with it on several occasions near Loch Assynt, and the latter gentleman once close to Loch Inver’. The refererence harks back to an earlier work on The mammals and reptiles of Sutherland published in 1875, so the record dates back at least 135 years. However, no determined attempt has been made to re-find the species in Assynt, and it may still occur. It is unmistakeable in both size and colouration, and if still occurs, the most likely place is one of the richer lochs along Loch Assynt side, or on the coast road. 6. What to record. Much of the above account is based on an amphibian survey undertaken by the Field Club in 1993 (see report 6.2.94). Since then, a large number of observations have been made and logged, and these can be seen here Amphibian and Reptile Records. Still worth recording are: any observations of adults or spawning sites away from habitation, especially in more remote sites and up in the hills (particularly common toad and palmate newt); first spawning dates from sites that you can visit each year; dates for the emergence of froglets and toadlets; dates of the autumn movements; any evidence of unusual deaths (there have been some signs of disease in local frogs) or predation. Please send your records and photographs to assyntwildlife@gmail.com. 7. Further information. For a good illustrated account of all the British amphibians see Complete British Animals by Paul Sterry, first published by HarperCollins in 2005. A more discursive text is the New Naturalist volume Amphibians and Reptiles by Trevor Beebee and Richard Griffiths, first published by HarperCollins in 2000. Relevant websites are those of the British Herpetological Society (www.thebhs.org) and Amphibian and Reptile Conservation www.arc-trust.org.